The boss of a bed-making firm has been found guilty of human trafficking. Mohammed Rafiq employed large numbers of Hungarian men as a "slave workforce" at the now defunct Kozee Sleep in Ravensthorpe, Dewsbury, West Yorkshire. Leeds Crown Court heard how staff at Kozee Sleep were paid as little as £10 a day. 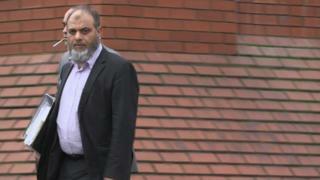 Rafiq, 60, was found guilty of conspiracy to commission a breach of UK immigration law. He will be sentenced on 12 February. Rafiq, of Thorncliffe Road in Staincliffe, used to run Kozee Sleep from an industrial estate in Ravensthorpe. The firm supplied companies including Next Plc, the John Lewis Partnership and Dunelm Mill. Prosecutor Christopher Tehrani QC told the court that ethical audits by leading high street retailers had failed to spot what was going on. Rafiq's conviction follows that of Hungarian men Ferenc Illes and Janos Orsos, who were jailed last year after being found guilty of supplying Kozee Sleep with slave labour. The traffickers' victims survived on scraps of food, with up to 42 men living in a two-bedroom house, Rafiq's trial heard. An investigation was launched into Kozee Sleep and its Batley-based subsidiary Layzee Sleep after Orsos and Illes were arrested. At the beginning of the trial in October, Mr Tehrani told the court Rafiq knew Orsos's organisation would source him "cheap slave labour to work at Kozee Sleep and Layzee Sleep factories". Two of Rafiq's employees, Mohammed Patel and Mohammed Dadhiwala, also stood trial accused of conspiracy to arrange or facilitate travel within the UK for exploitation. However, on 15 December the case against the pair collapsed and the trial continued with the same jury, with only Rafiq as a defendant. The court heard how the trafficked men were promised good wages, housing and food in the UK, but once in West Yorkshire found themselves living in shared, cramped and squalid accommodation with many others. They were made to work for long hours, from 10 to 16 hours per day, five to seven days per week. The jury was told how one man, Robert Bodo, travelled to Batley from Hungary in January 2010 and was taken to live in a town property called Gothic House, where 40 to 50 people were living and he shared a room with three others. Mr Tehrani said inspectors found the house was in "a horrendous state". Mr Bodo was at Kozee Sleep for three-and-a-half years, where he worked a minimum of 60 hours a week or had to do extra work somewhere else. Det Ch Insp Warren Stevenson, of West Yorkshire Police's human trafficking unit, said: "Clearly we welcome the conviction of Mohammed Rafiq. "A great deal of time and effort has been invested by police and partners in mounting this prosecution and in securing today's outcome in court. "I hope this conviction demonstrates to victims of human trafficking that the police and authorities will act on their behalf and are prepared to support victims throughout the legal process to secure justice for them." The Independent Anti-Slavery Commissioner (IASC) said it would become "more and more difficult for traffickers to operate" and there will be "many more" of this type of conviction to come, since new anti-slavery legislation was introduced in July. Under the new laws, businesses with a turnover of £36 million, such as Next Plc and John Lewis Partnership, must publically state what measures they are taking to eradicate slavery from their supply chains.